I think I learned something at the New Attitude conference. I definitely learned a lot about the gospel, but that’s not what I’m writing about right now. I think I learned something about the psychology of live production. When New Attitude began, seven conferences ago, the sound experience was beyond phenomenal. Everyone came back amazed at how great everything sounded. And ever since Covenant Life moved into it’s new building four years ago, we’ve been working to make our monthly Friday night One Meetings as close to the Na experience as possible. These come amidst a resounding response from all that the sound this year was better than it ever has been. What’s missing? I think the missing component was the significant contrast between the normal and the Na. Here’s my “discovery”: the excellent production and high-impact sound that have become so commonplace at Covenant Life is leading to conferences seeming less experientially unique. I think attendees are expecting MORE than their own “norm,” regardless of what that norm is. Na has to be better or louder or grander or cooler or just more — not only than the last conference — but than what they experience regularly in their churches. Is it possible that we are falsely leading people to expect an ever superior media experience year after year after year? Is it possible that we are neutralizing people’s appreciation for excellence by providing it so consistently? New Attitude day two and day three are gone. Since my last post, we've had five main sessions, seven smaller seminars, and two concerts (one of which is happening even now as I write). Spiritual highlights have been ably posted on the Na Blog and Solo Femininity, Carolyn McCulley's blog, so I'll let you read there to get a taste for the content. There are also some great pictures of the main session, too, if you're interested in seeing what it looked like. Line Arrays -- I spent 16.5 hours straight in the main room on Sunday, with a 10-minute break to get a muffin from the lobby Starbucks. Nonetheless, even after mixing three worship sessions and a rap concert, my ears were not fatigued. I attribute that primarily to the JBL line arrays, which really fit this space well. For the first time at Na, I don't feel like I'm fighting the system or the room to hear all the nuances I want. The total recall and compression on every channel have sold me. Now I just need patience from God to wait until the appropriate time to change out our mixers at Covenant Life. It'll probably be another six to ten years. Who knows what will exist then? The Choir -- We added a choir to the worship band this morning, replacing the solo backup vocalists. I'll be honest. I wasn't hip on the idea. I was wrong. The choir did a fantastic job. Specifically, there was a wonderful moment during the song Grace Unmeasured, just as we hit the chorus for the first time. Normally, the men and women split up and sing different parts. The choir took the women's line and the result was beautiful and invigorating. Weston, who has been helping me at front-of-house, spontaneously said "Wow!" out loud. The moving lights did move this morning. A little. And this evening's walk-in video "scenery," representing the city, was way hip. It was some combination of time lapse and time-slowed videography. Accompanied by tracks from Jry's remixes for Voice's album, it really did feel urban. Quiz: what song did that title put in your head? Sound -- Yamaha PM1D: Nice! JBL Vertec Line Arrays: Very Nice! The band was tight, the mix went well, the lavs were clear. The message was heard. Praise God. 200Hz is killer in this concrete box, though. I'm wishing the system had a bit tighter punch. Lighting -- Simple and effective. But will those moving lights move? Video -- We've got two 12s, the 16, and two 24s. That's the diameter of the each of five circular video screens. IMAG looked great on the 24s. The 12s...well the projectors aren't bright enough. See the New Attitude blog for pictures. Hopefully sometime soon they'll have main session shots up. Solo Femininity is live blogging, too. Read more at those sites to hear about what God is teaching us. For the last few weeks, we've discussed sound system gain structure. We've covered matching signal levels, matching impedance levels, and unity gain. I'm going to push the pause button momentarily in order to help bring clear application to these principles. How can you make sure your system has been set up correctly? Here are the steps. First, use a tone or pink noise generator to send a consistent tone through your system. You may want to shut off your amplifiers in the beginning to save your sanity. Some consoles have tone generators on-board, or you can purchase a CD with tones on it and put one of the tracks on repeat. Plug the tone generator into one of the inputs on your mixer. Adjust the gain knob (trim) so that the tone is steadily at 0dB on the output meters of your board. Now, step one piece of equipment at a time through the signal chain of your system. Set the output of the first piece and the input of the next at unity gain. Check your output and input meters. They should both register at exactly zero dB. Continue this all the way through to the input of the amplifier. If the input of the second piece of equipment is significantly lower than zero dB, you have a gain structure problem that will most likely lead to increased noise. Check to make sure that the levels match, the impedances match, and that you are setting everything at unity gain. If the input of the second piece of equipment is significantly higher than zero dB, you have a gain structure problem that will most likely lead to distortion. Again, double-check all the things above to identify where the signal jump is happening. Once everything is matched and set correctly, play your favorite CD through the system and turn the amplifiers up until your system reaches an appropriate level for your church's style of music. The amps may not need to be turned up all the way. This is fine and likely means you will be minimizing noise in the system while maximizing your dynamic range. Finally, practice with your singers, band or worship team at least once before the next Sunday. If you find that you are hitting red lights on any equipment, go back and turn the amps up just a little until you are able to turn down the output levels of your mixer so that nothing distorts and you have a little extra headroom left over. Now you're good to go! My parents are fans of American Idol. I had never seen it before, but my wife and I watched some of the final episode and some of the awards presentation with them. Talk about a production! They had all the cool toys, gadgets, set-pieces, tons of cameras. I thought the overal production was excellent, especially since it was live. On Wednesday Taylor Hicks won the right to be the next American Idol. My parents were thrilled. That's who they tried to vote for, though their call didn't get through. Taylor seemed pretty happy, too. He shouted something like "I'm living the American Dream!" during his last song. And we all lived vicariously through him, loving the attention, the spectacle, the reward for hard work, the fame, the adoration, the hope for the future. The day prior, my five-month-old daughter visited her great-grandmother Wilcox for the first time. Great-Grandma had been waiting all day in the sunny entrance to her assisted living facility because -- though she couldn't tell you what she had for breakfast that morning -- she knew her great-granddaughter was coming to visit that day. She didn't know what time, though. So she waited there for hours, happily anticipating our little girl's arrival. What happened at 4PM was a moment I'll never forget. My grandmother -- weekened by the recent passing of her husband, two moves in a few months, an earlier battle with cancer, numerous falls and broken bones, and the more recent loss of memory -- held my little girl for the first time, the first Wilcox great-grandchild. Great-Grandma smiled. A lot. Which is much more than normal, I'm told. Honestly, I think it pretty much made her year. At one point she said through tears of joy, "It's just great to be family and to be together." She was right. On Wednesday night, when Taylor Hicks won, I couldn't help but remember our family moment that occurred the day before without any cameras, lights, hype, makeup, or hoopla. When Taylor Hicks is 85 years old and has been totally forgotten by his fans, I hope he has a great-grandchild to come to visit him. The last and final New Attitude conference occurred in January of 2004. Or so they said. Thankfully, New Attitude is back. The 2006 conference is this weekend and tomorrow my family and I head to Louisville to prepare for an action-packed four days of teaching, worship, and fellowship. I'll be kicking into conference mode on Thursday evening after visiting with some family who live in Louisville. The New Attitude conferences are extremely special to me because a woman named Cara Nalle was significantly transformed through the teaching and fellowship at one of the conferences. Only two years later, she was the main session director for the conference, where we got to work more closely together. By God's grace alone, we now work together daily in the pursuit of the glory of God as we build our family as husband and wife. I do hope to continue blogging this week, but I'll have to see how things go. I know that Sunday's schedule begins at 8:00a and ends after three main sessions and a concert at 12:45a the next morning. The posts most likely will be haphazard. I'll probably be straying from my normal blogging schedule. But I'll keep you updated on what's happening and what I'm learning at Na. Oh, and if you're going to be there and want to say hello, come on by the main sound board before or after any of the main sessions. I'd love to meet you. Lah lalah lalah... I was walking back around to our front of house area after discussing a few tweaks to the timing on IMAG transitions with our video producer. The morning had been pretty calm, so calm that I didn't fell pressed to get up to him until after the second service was under way. Robin Boisvert had delivered an excellent message on the beatitudes, challenging us to look forward to the future life, where those who are poor, who lack, will gain the kingdom. The hungry will be full, the mourning will laugh, and those rejected for the sake of Christ will find eternal reward. The room was full of conviction and faith. But, the backup wasn't working either. Now it was time to hurry! I flew by the kids on the stairwell and ran into the main auditorium. Our senior pastor was talking without a mic, OVER THE DIN OF A FEEDBACK-LIKE TONE THAT WASN'T GOING AWAY! This was worse than I thought! When I reached the booth, another faithful team member was already there helping our mixer try to remedy the situation. He had made a good decision to power down the system and get rid of the "feedback." I got the report when I stepped up: the DSP system processor that controls the entire LCR sound system and four segments of delays decided to decompile (aka stop working) and spit out a nasty, continuous tone. OK, so here's a nightmare come true. Four years ago, when we designed the system, we sat around a table discussing whether we should go with a single DSP-based box to control our entire sound system. What happens if it the whole things fails outright? Would it be able to come back alive? What backup options would we have? Now I know what happens when it fails. Ugly! Thankfully, a quick reboot got the system happily DSPing again. I couldn't find any problems in the self-diagnostics. That made me feel better. Mostly. I'll be having a very serious discussion with the manufacturer tomorrow to find out exactly what happened. By God's grace, I attend the most flexible, joy-filled congregation in the world. Our senior pastor very graciously led the church without a sound system while we troubleshot for four minutes. And by God's mercy, many people were affected by the silence as we handed out communion, and enjoyed singing a capella instead of with the band. The congregation continued to worship God, regardless of the circumstances around it. Blessed are those whose sound system breaks, for they will worship the Lord! About 20 years ago, churches began pursuing technical excellence seriously. Since then, excellence has become a driving force in much of the Christian community. The goal of reaching technical excellence has spawned multitudes of markets, magazines, discussion groups, online communities, seminars, and conferences. Though some churches and pastors don't desire excellence, many churches truly are pushing the standards of technology use to ever higher levels. And those tech-savvy churches are impacting almost all other American churches. But why pursue excellence? Why all the effort, energy, and money in technology and media? I'm assuming that if you're reading this, it's because you have some desire to excel in what you do for the Lord. So, why do I ask these other questions? It's not because I doubt the importance or the effect of excellence. I ask because I firmly believe that motive matters. Whenever what we do matters, why we do it matters even more. So why should we pursue excellence? "Work heartily" clearly commands hard work with the goal of doing an excellent job. More importantly, I see three ideas in this passage that help me understand why I should work hard to reach excellence. Always pursue excellence because God is always watching. Never pursue excellence because other people may be watching. The excellence of your work will impact your inheritance in heaven. Why do you pursue excellence? Consider a couple things: 1) a person singing moderately will be 80-85 dB in his own head. A person singing at full voice will be 90dB in his own head. 2) An enthusiastic congregation singing a capella can easily get up to 88-93dB in everybody's ears. 3) The ultimate goal of a mixer is to allow people to hear everything, meaning everything needs to be loud enough and adjusted so that nothing "covers up" anything else. At Covenant Life, I have about 5dB of range between "loud enough" to be heard over the congregation singing (93dB -- yeah, we sing loud) and "too loud" such that it will cause people hearing damage (98dB). Anything that I want to be heard clearly during singing will have to squeeze between those two levels without getting in the way of each other. That's why mixing in a church that sings loudly can be such a challenge. And that's why the temptation is to turn it up. This is where sound mixing becomes an art. And from my perspective, mixing worship is really an art of managing competing priorities. Here are my audio priorities for music in worship and a brief explanation of why. Before adopting these, you may want to talk to your pastor and understand his priorities. Priority #1: The congregation should be able to hear the worship leader. This allows everyone to follow along and hear the melody. Priority #2: Each person in the congregation should be able to hear someone singing his or her part. I find it helpful if the men can hear at least one male voice and the women can hear at least one female voice, so they can follow along more easily. Priority #3: Each person in the congregation should be able to hear others singing with him. If the musicians are so loud that no one can hear other people sing, the band is simply too loud. We are called to "address ONE ANOTHER, singing psalms, hymns, and spiritual songs" (emphasis mine). Priority #4: The congregation should be able to enjoy the musicianship of the band members. They aren't up on stage just to look pretty but to enable good music to draw people's hearts toward God. Let them be heard! What this means when I mix: If nothing else is heard, the worship leader is heard. If anything has to "be lost" amongst the crowd "noise," I'm going to lose the band first. But I work hard and challenge my mixers to work harder to make sure that everything can be heard even though we have such a narrow range between distinctly hearable and too loud. That's the challenge and fun and art of mixing! I just got the scoop on Covenant Life's annual volunteer service weekend, called ServFest. It has me thinking again about recruiting people onto the production teams. From a practical standpoint, the most important thing to have in place to prepare for recruitment is a team structure. Even if you are serving in a small church, and you only have two or three volunteers, a team structure is essential for including more people in your ministry, especially technical ministries. Why? People want to sign up to play a part in an eternally important project. They will be less likely to sign up for something that doesn't seem important. Similarly, they will most likely not sign up to "volunteer for life doing something" in a particular ministry. Most people I know will be hindered from joining a volunteer team if they don't know what role they are going to play and how long they are expected to serve. 1. Break down all the things your team does into specific, manageable roles. From my limited vantage point, most churches overwork their tech folks. And most tech folks overwork themselves. There are usually a couple "experts" hanlding everything. I think it is better to have more people involved, doing a very specific and simple set of tasks. Even though everyone has some down time, everyone knows peace. Imagine that! Also, more on point with recruiting, having a team with specific roles allows the team leader to know how many open positions exist and how many new recruits to call on. Also, new volunteers can see clearly how their potential role is doable with a little training and will not be fearful to jump into turning the knobs and pressing the buttons. 2. Make sure to have a leadership structure. This is especially important for larger teams. One of the most frequent and fearful questions I get from new volunteers is, "Soooo, am I going to be in charge?" Most often they don't want to have that much responsibility from the get-go. It's important to be able to say to them, "You are responsible for such and such, but you can always go to [enter leader's name here] with questions, and [enter leader's name here] will be giving you instructions while you're serving. They are in charge." 3. Make sure to have a beginning and an end date. Not only do teams need a people structure, they need a time structure. I want my potential recruits to know for sure that they aren't being asked to sign up for life. I also want them to know that they can't walk out at any time. Whether it's six months, one year, or two years, make sure potential volunteers know how long they are committing to serve with you. Just a little structure can go a long way in helping potential volunteers become confident that they can make a commitment to your team. Take the time to create that structure and see how many people are able to join in on your critical mission to present the gospel. Creativity and art are gifts from God. However, creativity for creativity's sake has no place in a worship gathering. Worship of Jesus Christ should include creativity, but only creativity that exists for the sake of the glory of God. Therefore, a church video system should exist for the glory of God, for his honor, his purposes, his message. For the next few weeks, I want to discuss imag (image magnification) as one aspect of video in a worship service, and how I think it can be best used for God's glory. For those of you unfamiliar with image magnification, imag is the use of live cameras and video projection screens to allow people further from the subject to see better. Essentially, imag is a sound system for our eyes. This week, we'll discuss the call for technologies like imag. The next couple weeks I'll introduce my best and worst practices for imag during a worship service. Imag helps more people at once to experience God's message. Jesus called us to communicate broadly when he commanded his disciples in Matthew 10:27, "What I tell you in the dark, say in the light, and what you hear whispered, proclaim on the housetops." Imag helps people to fully understand the nuances of preaching. Paul instructs his young pastor friend in 2 Timothy 4:2, "Preach the word; be ready in season and out of season; reprove, rebuke, and exhort, with complete patience and teaching." Preaching from the heart will lead to reproof, rebuke, and exhortation that each carries it's own emotion, facial expression, hand gesture, and so forth. Imag allows us to transmit that emotion and meaning to everyone in the room rather than just the first few rows. When we introduced imag at Covenant Life, we based our use of the tool on these two primary principles. Although we designed the system to be able to produce more "artistic" output, the team members focused on helping people to see and emphasizing what the pastor was saying from the pulpit. This cleared the way for simplified training, early implementation, and a seemless integration. What could have been a very "disruptive" change was quickly and enthusiastically accepted by our congregation. I think this was primarily because the creative technology was designed and used to support what God was already doing in our church rather than becoming a new thing all on its own. What could have drawn attention to itself, drew attention to the word of God instead. I thank God for helping us and for giving me the most understanding and encouraging congregation in the whole world. My prayer is that any introduction of creative elements into your services happen as smoothly and effectively. Our Tuesday topic for the last couple weeks has been gain structure. If you haven't read the last posts, check them out at "Intro to Gain Structure" and "Matching Signal Levels". Today we'll cover the last couple ideas related to setting good gain structure: impedance matching and unity gain. Impedance is a measurement given the label "Z" and measured in Ohms (Ω). Impedance is similar to resistance, but it also includes some complexities related to AC signals which we don't need to understand for this discussion. Impedance in audio equipment is either high (Hi-Z, 10KΩ) or low (Low-Z, 600Ω). While matching signal levels is essential to get correct gain structure, there is a little more flexibility on impedance levels. The key to "matching" impedance levels is to make sure that the output impedance of the one piece of equipment is lower than or equal to the input impedance of the next piece of equipment. Professional audio equipment is always designed this way, with very low impedance outputs and very high impedance inputs. However, it is worth taking a look at your manuals to make sure that is the case for all your equipment. Why does this matter? If a connection made so that the signal goes from Hi-Z to Low-Z (opposite the way it should go), the signal will distort and signal levels will be unpredictable. That introduces its own "noise" and could undo what you've already gotten right by setting signal levels correctly. Ever wonder what that "U" means on the sliders on your mixer? The "U" stands for unity gain. That means when you place the slider there, the voltage that comes in is the voltage that comes out. Every piece of audio gear has a "U" on its knobs, though the manufacurer may not have been nice enough to label it that way -- some of you were saying, "My mixer doesn't have a 'U' on it!" It probably says "0dB" instead on yours. Anyway, even the knobs that go from "0" to "10" around the dial have a place that is unity. To get the best gain structure, you need to make sure you're passing unity signal through all the components in your sound system. This means that no voltage is being cut (lowering your clipping level) and no unnecessary amplification is happening (raising your noise floor). Therefore, you should always set the input and output levels of all your gear at "unity" in order to get the best dynamic range. If you find that you have to crank a knob beyond unity or cut it way back below unity in order to keep control of the sound levels in your system, that probably means you have a gain structure problem. But how do you know what unity is on your piece of equipment? You got it: read the manual. Everyone does it differently (especially those 0-10 kind of knobs), so please please please check out the manual. Then set your knobs to unity, and see the difference it makes! Yesterday, I highlighted true servanthood exemplified by Jesus in John 13. Jesus said, "If I then, your Lord and Teacher, have washed your feet, you also ought to wash one another's feet... If you know these things, blessed are you if you do them." Today, our Sunday service appropriately honored other people who clean up messes to the glory of God: mothers. Isaac Hydoski equipped us from Proverbs 31 to honor our mothers and our wives (listen here). Why? "What we do on Mother's Day is an opportunity to value what God values and honor what God honors," he said. I want to take this moment to honor my bride, Cara, whose example and life have changed me in every way. She has helped to clean up many of my messes, both literal and figurative. Specifically, I want to thank God because she loves our Savior so much that she sacrifices repeatedly and joyfully. She laid down her ideal job in church ministry in order to most effectively raise our daughter in the fear of God. The staff and pastors definitely miss you around here, but I love coming home to your embrace. She goes to great lengths to accommodate my unusual schedule at the church. Thanks for packing up the 14 pounds of baby girl and 200 pounds of baby stuff for our trip today. She wakes up several times a night to nurture a hungry little girl. I'm so sorry for all the times I've said, "Did she sleep through the night?" when I was the only one who did. She's set aside her desires for beautiful furniture and a fancy home, so that I can invest in the gospel. Babe, I promise someday we'll get that living room painted. Thanks for your patience. And she's done this -- and all other sorts of sacrifices -- without complaining, questioning, or even a hint of bitterness. Only God's grace and power could lead to that kind of feet-washing! Thank you, my love, for not only knowing about Jesus example, but for also doing it. You will be blessed. I do pray that I can obey God by appropriately honoring you throughout your life. Though I will fall short, One will not. Isaac said this morning, "Our honor should be a quiet echo of the praise of their God saying 'Well done.'" I hope you hear this echo, however quiet. I love you! Happy Mother's Day! I want to highlight some people that I believe God will bless because they wash other's feet. They clean up other's messes. They cleaned up my messes! Today was one of our quarterly Tech Team Work Days. On these fun and unusual days, the tech teams take over the entire church building for 8 hours to do what I call entropy-reversing chaos-control. Basically they clean, fix, organize, and improve. They vacuum filters, mop floors, clean carpets, solder cables, organize shelves, label everything, and throw a whole lot of junk away. They do dirty work, and lots of it, effectively washing my feet and the feet of the whole church. Feet washing honors God! When we do the dirty work, we exalt Christ by following his example. We admit that he is our master and that we are his servants. We are not above doing menial, humbling things because he was not above it. And we worship the Father by believing that he blesses those who serve others. I want to thank Anna, Bob, Austin, Larry, Ebert, Sam, Nate, David, Danny, Phil, Kila, Alex, Frank, and Josh for taking a day out of your busy lives to serve others secretly and sacrificially. I believe you honored our Savior and will be blessed. "A church in our community just had her Youth Minister arrested last Friday night. Seems an ongoing dispute with neighborhood residents about the volume has reached critical mass. One resident swore out a warrant for disturbing the peace, and the police, following procedure I'm sure, acted on it. The affidavit alleges the church played excessively loud music from 7 pm to 10 pm several nights a week." With "contemporary" music as the standard fare of many worship teams, and with churches striving for relevance with young unbelievers, singing in church often resembles a rock concert more than a choir performance. As a result, the volume levels in churches do seem to be increasing overall. This causes great concern among some people, including many that attend Covenant Life with me. Some complain it's too loud. Some wonder whether this will damage their hearing. Some want it turned up. I'm sure I'm not alone in this. How do tech team members respond to these various questions and concerns? It can be difficult to answer people because they may say "it hurts" or "it's uncomfortable." They have concerns about their children or their elderly parents. Everybody is different both in their preferences and in their bodies, so how do we know if someone is really being hurt by our music? First, let me say this: We must respond. We must have an answer for the people who are concerned, even if we can't explain it to them at the moment they ask. To simply shrug off these concerns is irresponsible, uncaring, and possibly even sinful. We will be held responsible by God for anything we knowingly do that hurts others. I think the best way to answer these questions about safety is to point to the legal standards that government scientists have put into place. As you will see, this may make some people unhappy and others thrilled. But it's the most accurate and fair way to help lead our sound board ops as to how loud they should mix, without having to be swayed by the most recent complaint. So, on to the question. How loud is too loud? Although there are many different scales out there for loudness levels, the legal limits are set by the Occupational Safety and Health Administration (OSHA). Check out their standards table. These standards reflect the maximum sound pressure level that a person can experience for a certain duration of time without noise-induced hearing loss, to the best of our knowledge. Here is what I see when I read this table. Covenant Life attendees will sing for a maximum of 40 minutes at the beginning of our service and 10 minutes after, for a total of 50 minutes with the band. I'll round that up to an hour to be safe. According to the chart, a person can listen to music at a sound pressure level of 105 dBA without any expectation of noise-induced hearing loss. Also, an important note is that dBA is a different scale than dBC. dBC is more sensitive, so if I run the system at 105 dBC, the sound pressure is actually less than 105 dBA. Therefore, our normal spl's of 95-98 dBC are well within the safe range for our church members. However, we don't get off that easy. There will be people who attend more than one service. We have two services, and some servants (including the sound mixers and musicians) will be there for both. What about them? To be safe, let's say the sound folks and the musicians are there for one hour of rehearsal and two services, each with one hour of singing. This is way over the actual time, but I'd rather be safe. For three hours total, what is the max sound pressure level? Around 97dBA. Again, our 95-98dBC levels are safe, but they are on the edge. I certainly don't want to go beyond this. And that really only applies for the sound mixers. The musicians are harder to judge, since they are under headphones and get to set their own overall levels. Nevertheless, with this simple math complete, I can honestly answer people, regardless of their perception, that I believe our sound levels are reasonable and safe. Would you agree? Have I missed something? Maybe more importantly, can you do the same? I challenge you this weekend to think through your sound pressure levels. Consider your service times, exposure durations and the different people who attend. Is anyone at risk of hearing loss? What do you need to do to change? Unless I get other questions, I'll answer the more subjective side of the question, "How Loud is Too Loud?" next week Friday. Vision-casting is a hot topic in the church these days. Yesterday, I did a quick technorati search on vision-casting, to see who's talking about it, and I found that five of the top six hits were from seemingly Christian blogs. Vision-casting is significant when it comes to building volunteer teams. During a volunteer recruitment training session at the KidStuf conference at Northpoint Community Church, I heard that the first thing a team leader needs to do is to cast a vision. Next, recruit to that vision. These ideas have been very helpful for me in shaping how I've built teams and how I recruit volunteers. However, because I do think that words matter, and semantics are often more than "just semantics," I'd love to ask some questions. How does the Bible call us to serve each other in the church? Is it simply a matter of vision-casting? Or is there more to it? I think there is more to it. But what else matters? Other than just a clear mission statement or set of goals, what should we bring to people's attention when we ask them to serve? And how should that affect our "vision-casting?" Vision-casting is useful in that it gives people a great goal to work toward. However, the Bible is not only concerned that we reach the right goals. It also commands us to be motivated by the right reasons. My fear today is that churches are motivating their people to serve based on excellence in outcomes. "Come join our team because we make really cool, professional videos" or some such reason. People do want to be on a "winning" team. And excellence will cause them to sign up. But when that is the call, are they joining for the right reasons? Maybe, or maybe not. Church media team leaders have a responsibility to make sure, as best as possible, that people not only serve with the right goals in mind, but also with the best motives. We must motive-cast. Our job is to help people identify Biblical motives for serving and assess whether they are signing up for the right reasons. How does God's grace to me through saving me and changing me affect my desire to participate on this team? How will this team help me advance the gospel of Jesus Christ? How will this team lead me to growth in godliness? How will my participation in this team support the goals of the church? How will this team allow me to build the church community? How will I earn rewards in heaven for the glory of God on this team? I think the answer to these questions will get at the heart of what should motivate us to serve. Start with yourself: Are these your motives in service? Then ask of your team members: Are these why others are serving? A test: What excites you more? The quality of your tech and media? Or the gospel of Christ, your growth in godliness, the people of your church, and what serving means for the glory of God in heaven? We live in a mediated world. All communication requires a medium. We always need some sort of device to transfer ideas between people. Even in our closest relationships, we can't read each other's minds. Just ask any husband or wife. We need to speak, to write, to draw, to communicate via a medium of some sort. God is not like us, however. He is not limited to communicating via media. He knows our thoughts from afar. He can speak to our minds directly, and individually, even if we are not alone. Being the greatest evangelist in the universe, God could teach people the gospel and save them without help from anything or anyone in this world. However, God is not like us! In God's independent pursuit of his own glory, he has chosen to entrust his message to the church. He has called his people to be the media of his gospel. Why do I bring this up? As I discuss media tools and their most effective uses for the gospel, I need to remind myself that all my labor to create better videos, greater mixes, more useful websites, more engaging dramas will have little foundation if I am not taking my responsibility for personal evangelism seriously. Let's be real, here. For most of us, including me, it's easier to sit behind a computer and type a script or edit a video than to build friendships with neighbors and faithfully share the truth of Jesus Christ with them. And yet we -- all believers in Jesus Christ -- we are the primary media that God has chosen to communicate the gospel. Our words and our lives are the sound systems and the video clips and the blogs and the radio programs that unbelievers really notice. They will watch our lives more closely than they watch our art. What message are you communicating? Is it the good news of salvation from God's wrath through the atoning sacrifice of Jesus Christ on the cross? Last week Tuesday we discussed the basic idea of gain structure. Gain structure is the way you adjust input and output levels on sound equipment to make sure you get the largest possible dynamic range. That dynamic range will give you a relatively noise-free system without distortion. Consumer Level :|: used by consumer audio equipment, keyboards, guitar pickups, and other instruments. A line level signal carries about 1V and is referred to as +4dB. A consumer level signal is between -10dB and -20dB and a mic level signal is -50dB. To "align" your components correctly, you need to make sure that the output level of each piece of equipment is the same as the input level of the piece that follows. The singer's microphone has a mic level output and plugs directly into your mixer which has a pre-amp which accepts a mic level input. Perfect. The guitar player's instrument level output could plug directly into the mixer, except that the mixer's pre-amp doesn't accept an instrument level input. To alleviate this, you add a direct box between the instrument and the mixer. The direct box can handle an instrument level input and outputs a microphone level signal which the mixer can accept. The biggest challenges to gain structure arise when you put a piece of consumer grade audio equipment in line with professional grade audio equipment. The system will probably work without correcting the level imbalances, but the dynamic range will suffer. The simplest (and most expensive) way to solve this problem is to make sure that every piece of equipment between the sound mixer and the power amplifier is professional grade and uses only line level inputs and outputs. However, sometimes the money isn't available or there is an old piece of gear that I just really love and want to keep using. To handle this, you have to put a level reducer inline between the output of the pro gear and the input of consumer gear. Then place a pre-amp of sorts between the output of the consumer gear and the input of the next piece of pro gear to bump the level back up. A good example of line balancers are the Whirlwind LM2U and LM2B. So, here's your job before our next installment in seven days: go and check the back of all your gear, or (heaven forbid!) the manuals, to see what input and output levels each piece uses. Then see if you have any imbalances, and try to fix them! The DaVinci Code comes out on May 19th. Based on the best-selling book by Dan Brown, this new movie will further popularize many myths and outright lies about Jesus Christ and the church. Today, Covenant Life Church welcomed Dr. Albert Mohler from Southern Baptist Seminary to help us understand The DaVinci Code and how to converse with our culture about the ideas it contains. After clarifying some of the historical errors in the book, Dr. Mohler asked a most important question in preparing for a discussion, "Why are people so drawn to a story like this?" He answered the question this way... When people read this book, they can question the legitimacy of Scripture and dismiss any thought that they are sinners. And then they don't have to look for a Savior. He then helped us understand how to respond with compassion, joy, and courage. I thank God that we have heard from such a winsome and intelligent person on how to obey the command of Collosians 4:6: "Let your speech always be gracious, seasoned with salt, so that you may know how you ought to answer each person." Look here to download the message. The mp3 and podcast should be up by Sunday afternoon. I also want to highlight a moment from our technical teams this morning. It was a moment of greatness, a moment of God-glorification, a moment of true humility. Our video team has been undergoing some leadership changes recently. Some people have moved away and others, those who have excelled, are being promoted to greater responsibility. In the midst of these changes, one of the team leaders came up to me this morning to recommend that I replace him with someone on his team. He thought this other person could do a better job than he was doing, and asked me to consider removing him from his current leadership role, so that the other person could take it. Thanks be to God for how much he is at work in the lives of the people of this church! I can't think of anywhere in the world where something like this would happen. But God implants such a love for the church in the hearts of his children that they prefer truly serving others over having a title, authority, or respect. Thanks be to Jesus Christ, and God our Father! My wife and I attend a small group with some friends of ours at which we recently read through the 4th chapter of Paul David Tripp's book Instruments in the Redeemer's Hands. The chapter is called "The Heart is the Target" and teaches that our lives are a series of worship moments. We are always answering the questions, "Are we going to worship God? Or are we going to follow after the sinful desires of our hearts?" "Heart idolotry can subvert even our most worshipful moments. For example, prayer is our most God-directed act, yet it too can be warped by an idolatrous heart. Have you ever rehearsed a prayer before publicly praying it? (You know, 'Our dear Heavenly Father ... No, no ... Our sovereign, gracious Heavenly Father ... no ... Father in heaven, we are ...') Why do we do this? Are we trying to get it right for the Lord? That doesn't work because he hears the rehearsal! Isn't it really an attempt to use public prayer to gain the respect of people around us? Because our hearts are captured by a desire for human approval, we use an act of worship to get glory for ourselves!" Even good things, even worshipful acts, even service to the church, can become the center of false worship. A ministry, a video, a person's comment, the pastor's approval of your work ... all of these could become false gods. So my question for your consideration today is this: When you are serving on your technical or media role, what are your moments of worship? When do you have to choose between worshipping God and worshipping something else? And which do you choose? In Revelation 19, John mistakenly began to worship an angel. The angel shouted in response, "You must not do that! ... Worship God." I wish my idols would do that. Unfortunately, our idols don't do anything to stop us. They just sit back and let us worship them. That's why we must proactively identify those moments of idolatry and shift our thoughts and our worship to the One True God. Consider... What are your worship moments? How can you worship God rather than yourself at those very moments? I haven't received any specific questions this week, so I'm going to answer a question that Anthony Coppedge posed on his blog Thursday. Here's the entry. He humbly asked for other's thoughts before making his own suggestions. Go check it out, and read the responses on his pages' comments section. "I've been trying to discuss the issue of 'quality' within the church, and I seem to be getting a bunch of blank stares from my pastor every time I talk to him about the issue. What do I do?" Here's my stab at an answer. If my team and I were in this situation, these would be the steps I would have us take to get us all on the same page, and hopefully moving forward toward improved quality. Prepare ourselves for a long conversation. It sounds like this person has already attempted several times to have a discussion with their pastor. This is a blessing! At least he has his pastor's ear. Remember that God is very patient with us as we learn new things. 1 Timothy 1:15-16 says, "The saying is trustworthy and deserving of full acceptance, that Christ Jesus came into the world to save sinners, of whom I am the foremost. But I received mercy for this reason, that in me, as the foremost, Jesus Christ might display his perfect patience as an example to those who were to believe in him for eternal life." We need to be ready to follow Christ's example of patience with us (the worst of sinners) by preparing for a multiple-step conversation with our pastor. Every time we don't make the amount of progress we like, we should remember how many sins we've been forgiven, and ask God to give us his patience. Biblically define our motives for quality. Remember the church is about God more than meeting the standards of the world. We need to find a passage in Scripture that really does call us to quality for the glory of God and help us define what that looks like. Colossians 3 is an example. It goes like this: "Slaves, obey in everything those who are your earthly masters, not by way of eye-service, as people-pleasers, but with sincerity of heart, fearing the Lord. Whatever you do, work heartily, as for the Lord and not for men, knowing that from the Lord you will receive the inheritance as your reward. You are serving the Lord Christ." Here is a clear call for quality, and it helps us define it as well. Quality is working heartily, sincerely doing everything you do as well as you can because God is watching, not because of what others see (or don't notice). There are other similar passages. The good part of this is that we get to test our own motives as well as show our pastor that we want to bring God glory, not just get our preferences. Recommend one or two ways to improve quality. I think there are three things that will likely shut down the conversation: our pastor gets overwhelmed with all our ideas, or he thinks they are too expensive and time-consuming. The way to alleviate these is to lay down our own preferences for the sake of the church. Even though we have a long list of ways to improve, we should only offer one or two suggestions to start. This will alleviate the overwhelmed sense he may get. Recommend inexpensive ways to improve quality. Let's admit it, we all need new equipment somewhere. But there are inexpensive (even free) ways to improve. Recommend those first, even if they aren't the most glaring issues in your mind. This will make sure we have our pastors confidence that it's not just about new gear. After a few rounds of free or inexpensive improvements, he'll probably be ready to receive ideas that will affect the budget. Recommend quality improvements that we can implement. The apostles in Acts waren't called to serve tables over preaching the word and prayer, and our pastor isn't called to solder cables either. We need to be 100% ready to offer our time and services to implement the great ideas we have. We will more likely walk away with our pastor's blessing on a project if it can be done without a lot of his time. Obviously, that's not always possible. But start with ones that he doesn't need to invest much into but he will still see the results. Review the results. Watch carefully to see if quality is improved. Ask others if it's making a difference and how much. Make sure that he knows and sees how things are going on the project and that he is aware of the impact it's having. But also be honest with him. Don't use this as a moment of manipulation to just get your next project underway. Be faithful. Go back to step 4 (or 3 or 2 or 1) and start again. If we make incremental improvements over the long haul, we'll start to notice quality differences. Hopefully we'll be able to help our pastor gain a desire to glorify God with excellence in the process. OK, I'll admit it: I'm spoiled rotten. I don't live in the world of your average church tech person. I get to use a bunch of really cool equipment. I work with some of the most godly and creative pastors as well as more than 140 of the very best volunteers in the entire world. And on top of that, I get paid. I'm pretty far from the normal church tech leader's experience. If those of us in large churches are honest, we have it pretty easy. With dozens of volunteers and even other paid staff at our sides, we really are blessed men and women. With all of these resources, it may seem overly easy for me to encourage others to "team build." I've already got teams. However, I think building teams is more than just having numbers on a team roster. What does it really mean to build a team for the church anyway? Here we see a direct command from God: use your gifts. Notice also the context of the command. God has your church community clearly in view. God wants us to work together with our varied gifts and varied grace to serve one another and the world that looks in on our lives. That's what I mean by "team building." Team building is really church building. It is something greater than team growth. It means making your service team a significant part of your church's community. Your technical or media team should be a group where people's relationships with Jesus Christ affect one another as well as the others they are serving. Church building is harder than team growth. Team growth calls for a recruiter. Church building requires God. Only God can turn doers into servants. Only God can cause fellowship to occur in the midst of a busy schedule. Only God can convict people of sin while serving. Only God can help people resemble and represent his Son. Let's pray that God helps us to build our churches, not just our rosters. If you, with God's help, build your team with community as one of your goals, I bet you will find others will want to join you in your endeavors for the gospel. Then you are not just building a support staff. You are building the church, and you are glorifying God. To introduce the topic of tools and techniques, I want to welcome you into my musings. Here is an exerpt from an email I sent my senior pastor asking some questions about our use of media at Covenant Life. ...How can we more proactively pursue glorifying God with how we use media as a church and in our church services? In my understanding, media are inherently amoral. They do no good or evil until taken into the hands of God or the hands of sinful men. They are essentially tools that can be used for God's glory, with many media forms in the toolbox, including preaching, sound mixing, light and set design, drama, video, imag, graphics, print material, internet, and more. Question 1: Do we have tools in our toolbox that we never use? Do we have too limited a view of what media can be used in a corporate setting? Consider communion and baptism. These sacraments use the media of food and water to help communicate the truth of Christ's gospel through taste and touch. Yet we rarely consider using taste and touch media in other ways. Do we have the potential to glorify God more fully by thinking beyond our current toolset? Question 2: Do we know how to use our tools most effectively? Are we thinking about the types of effects that certain media have and then choosing the medium that will serve the message the most? Our current creative process seems to go something like this: we decide we want to use creativity and/or media to help communicate particular truths; we choose a medium based on who's available, what we haven't used for a while, or something that we've seen recently that we like. These are sincere questions, not backwards statements about how I think it should be. I hope you can hear that I am wrestling with these ideas, and I'll wrestle with them publicly as I write on this topic. I'd love to hear your thoughts and ideas. I'll be writing about things I don't fully understand, hoping that I can start a meaningful dialogue with some of you about how to proceed in glorifying God most fully through the use of media. More posts on "Tools and Techniques"
Gain structure is one of those slightly mysterious, absolutely critical parts of good sound reinforcement. Perfect gain structure will lead to mostly distortionless and noiseless audio. Improper gain structure ensures hissy, crunchy sound. Let's all say it together: Yuck! Most of you sound people are probably familiar with setting the gain or trim knob on the mixing board. But gain structure is more than just getting that one knob in the right place. All the input and output levels of all the components of your sound system determine the system's gain structure, and therefore sound quality. So, let's try to understand gain structure as a whole. Today, we'll examine how dynamic range and gain structure interact. In the next few weeks we'll find out how to make sure you have good gain structure between system components and on your mixing board itself. First, I need to introduce the important term "dynamic range." Dynamic range is the difference between the lowest voltage and the highest voltage a piece of electronics can reproduce accurately. For sound equipment, then, dynamic range is the difference between the softest sound and the loudest sound that equipment can pass without distortion or noise. All pieces of audio equipment have a noise floor, which is the lowest level where the signal can be heard over the noise. They also have a clipping point, above which the signal will sound distorted. So, the effective dynamic range of a piece of sound equipment is the difference between its clipping level and its noise floor. ... Bad Gain Structure :|: The dynamic ranges do not line up. ... Good Gain Structure :|: The dynamic ranges do line up. For the purpose of these pictures, the sound signal travels through each component from left to right. If it helps you, replace components 1-6 with "microphone, mixer, compressor, equalizer, signal processor, amplifier, speaker" or whatever your setup looks like. Also, the rectangles represent the dynamic range of each piece of equipment. The bottom of the rectangle is the level of the noise floor for that piece of equipment. The top of the rectangle is the clipping level. Your system has good gain structure if the maximum level of the dynamic range of each piece of equipment "aligns" with the next. The bad gain structure shown in the first picture causes several potential problems. First, a loud but non-distorted signal coming out of component 2 will distort component 3. That distortion will remain in the sound throughout all the rest of the system and will be heard by the congregation. 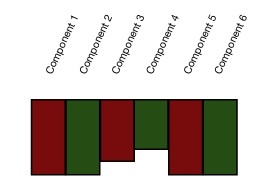 Second, a moderate sound coming out of component 3 will be below the noise floor of component 4. That noise will remain in the sound throughout the rest of the system and will be heard by the congregation. The maximum overall dynamic range of your system is equal to the dynamic range of the worst piece of equipment in the system. Even with the best gain structure possible, component 4 still limits the possible dynamic range of the system. If you gain structure is poor, and your dynamic ranges are not aligned, your effective dynamic range for the whole system is the difference between the lowest clipping level and the highest noise floor. 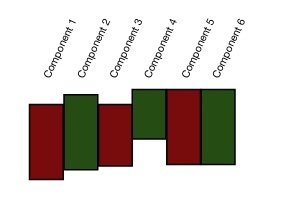 In the bad case above, the effective dynamic range is the overlap of component 3 with component 4, which is significantly worse than the whole dynamic range of component 4. What is the audible result of that poor gain structure? Your system is noisy generally and will distort at lower levels. That's why you want to make sure you have correct gain structure throughout your system. I'll stop there for now. Send me your questions, if this is unclear. I'll try to answer them on Friday or in the next few weeks as we explore gain structure further. Next week we'll discuss how to adjust your gain structure between components to align everything correctly. The week after that, we'll cover how gain structure works within your mixer. More Posts on "The Basics"